Full disclosure, I’m crazy about this book. The tagline reads 'Six Dangerous Outcasts. One impossible heist.' It’s often described as teenage criminals pulling off a fantasy Ocean's Eleven, even the author, Leigh Bardugo, says that’s part of how she came up with the idea. And it’s really, really well written. I have heard several people say that this book starts off slow, and if you’re listening to the audiobook, that certainly can seem that way when we get into the short snippet backstories of the crew. However, I also think that you have to know your tastes. 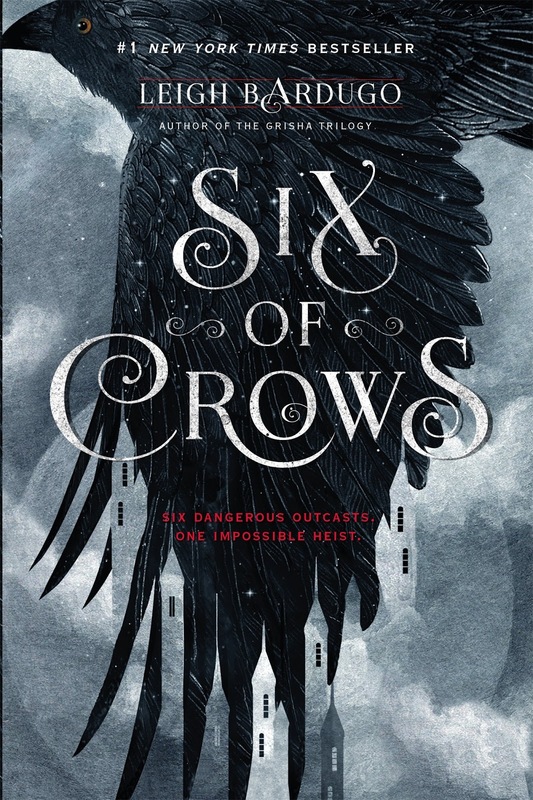 This book is a heist featuring protagonists between the ages of 16 and 18, it is a fantasy set in countries that are almost unnervingly like Eurasia, and it’s a big book about six people who have very different goals. But those backstories are also the reason I felt so deeply for the characters and really cared about how things went for them. Before I start gushing I want to address one thing that I found awkward: the homogeneity of the different ethnic groups. Fjerdans are all white and apparently all blonde and blue eyed, the Kerch do vary a little more but are predominantly white, Ravka has a variety of people living within its borders notably the nomadic Suli people, and the Shu Han are all dark haired and light-brown eyed. The country Zemeni is predominantly populated by people with brown skin, but we don’t see much of that country in this book except for meeting some people from that country across the sea. I found the very strict homogeneity of the Fjerdans weirdest of all, and the Shu Han as well, but it didn’t disrupt me enough to do more than make note of it and continue reading. This book has a lot of groundwork to lay, but I found it to be so tightly written that there was nothing extraneous. This book has been trimmed of all fat. In fact, I only questioned the necessity of one line, and then it came back to bite me. The footwork is intricate, and I found any of the necessarily explanations kept relatively short, but I think that can come across as slow and deliberate. I guess I was so hot with desire to put the whole adventure inside myself that I didn’t really notice the first time I read it. I loved the world building. I know that some people disliked the use of Eurasian countries as basis for this fantasy world, but I found it original and familiar, intriguing and comfortable at the same time. How many fantasies have been set in a pseudo England or America? I was ready for this change. While Jesper is and will remain my favorite, reading about Nina was kinda revolutionary to me. Representation matters, and I don’t think you really get how that feels until you connect so soundly with a character, and read other characters seeing your likeness and respond positively to someone like you. And though I’m not crushing on Matthias, the way he looked at and thought about Nina felt really, really good. I mean… the times he didn’t want to kill her, I mean. As a German national, I want to note the resemblances between the Fjerdan witch hunters and SS Nazi troops. I don’t know what Leigh Bardugo’s intent was but I don’t think the comparison of Fjerdan/Nazi is a bad one or an unnecessary one. History happened, Germany holds a great deal of responsibility in the largest scale event theretofore of its kind. An event so catastrophic a word was invented for such action: genocide. To deny that, or to deny its effect on modern history— it only happened 70 years ago!— is to deny the deaths, to erase the lives that were lost. So many are forgotten and their names will never be recovered. I feel that we often describe a fictional enemy as ‘Nazis’ with the expectation that we will find something barely adapted to a new setting as poor, boring and simplistic, but the Fjerdans here are not this. It can also be seen as disrespectful to the horrors that were perpetrated in Germany’s name during Hitler’s reign, to belittle those who were killed, but I also think that this is also not the case. Firstly, the Fjerdans hold trials. True, the Grisha never win, but this is different from ‘The Final Solution’. Secondly, as far as we know, the Fjerdans don’t target others based on skin color or belief. They think Ravkans are barbarians, but they don’t kill them outright as far as I know. Third, there is more to this story than racial prejudice, keeping blood pure and conquering another nation— again, as far as I know. It could be that there is even more than what Matthias knew and even what Brum knows. And if we could learn about the history and creation of Fjerda, I would eagerly read about that. True, the uniforms are black, there is religious superstitious rituals that tie to these heinous acts, likely the entire country shares prejudice against Grisha, and there are those who agree and those who secretly disagree. But as I already said, what really bothered me most about the Fjerdans is their homogeny— so much gold hair and glacier eyes! In the end, this book was amazing, and I as soon as I finished it, I immediately began to re-read it. I appreciate this book as a reader and as a writer, she clearly worked very hard on this. I loved seeing David Peterson’s name in the acknowledgements, even though I know she probably didn't do everything he suggested. There were so many great lines and moments. It was such an intense and captivating read. Don’t wait, if this sounds appealing to you in anyway, read it! I did not read the Shadow and Bone trilogy before I read this duology, and I was fine.